Connect wirelessly via your existing Philips Hue bridge. *Requires a Hue bridge to operate. Naturally blends into your interior. Up to 16 million colours, 800 lumen output. Incandescent technology. Larger light bulb that fits medium base socket. Standard Life Incandescent, vacuum or gas-filled lamp has a crystal clear bulb and a completely visible filament, so the brightness of the light is not 'softened.' It imparts a sparkling radiance to larger luminaires and wall brackets with textured or satin-etched glass and cut crystal. It is the appropriate lamp for large luminaires with clear glass bowls, mounted indoors or outdoors. It is recommended in all such cases where brilliance and sparkle are more important than the avoidance of glare. These lamps are also used for indirect lighting in closed luminaires. Tired of changing light bulbs that burn out too frequently? Try the DuraMax line of 3 Way Light bulbs. DuraMax light bulbs meet your general lighting needs while reducing the hassle of replacing your bulbs every few months. Glare-free soft white light, ideal for reading and other activities. Philips fluorescent lamps have a specially formulated powder coating that brings colours to life in any room of your home. Daylight Colour, creates the coolest indoor environment. Improved fluorescent lighting that satisfies those who prefer the cool blue-white illumination of daylight. This light enhances the appearance of your white kitchen, and creates a cool, refreshing environment for your living space or home office. 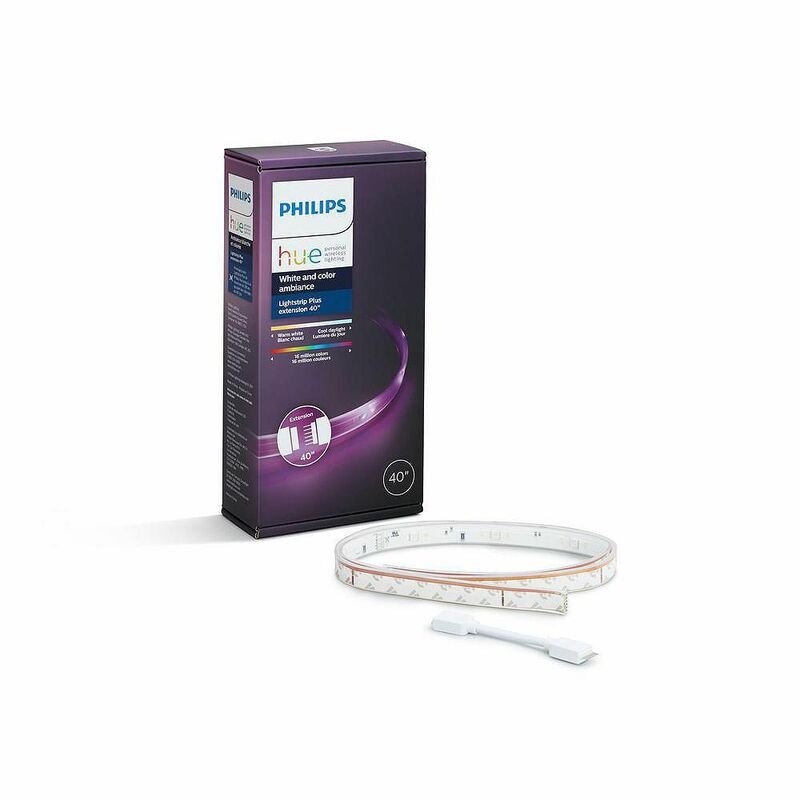 Hue 1m Extension for Lightstrip Plus is rated 4.4 out of 5 by 45. Rated 5 out of 5 by StaceyK from Super fun. We love these light strips. Best purchase ever.... Super fun. We love these light strips. Best purchase ever. Rated 4 out of 5 by HomeDepotCustomer from I used these under my cabinets in my kitchen. I... I used these under my cabinets in my kitchen. I would have liked the glue strips to be a little more sticky. They take quite a bit to make them stick well. Rated 4 out of 5 by MyTMcP from Really simple to use. Peel and stick. You only need one Hue Light Strip Plus with these as well a... Really simple to use. Peel and stick. You only need one Hue Light Strip Plus with these as well as a hue hub to control them. You can splice strips together but this is but far easy. Four stars instead 9f five because you can only change color, dim and turn on/off. Simple set up should be able to chase or blink in this day and age. Rated 5 out of 5 by HomeDepotCustomer from I have a newer townhouse with lots of white walls.... I have a newer townhouse with lots of white walls. This light strip above my kitchen cabinets applies color to my room, especially in the evenings and early mornings. I can change those colors very easily from my phone or tablet, depending on my mood. Rated 4 out of 5 by Donny from Adding this string to my existing string lights up the whole room. Adding this string to my existing string lights up the whole room. Rated 4 out of 5 by xtine from Really like these, I have them as cabinet lighting. ... Really like these, I have them as cabinet lighting. Easy to install. I just wish I could do multiple colors on one strip or an hombre effect. that would be fun!